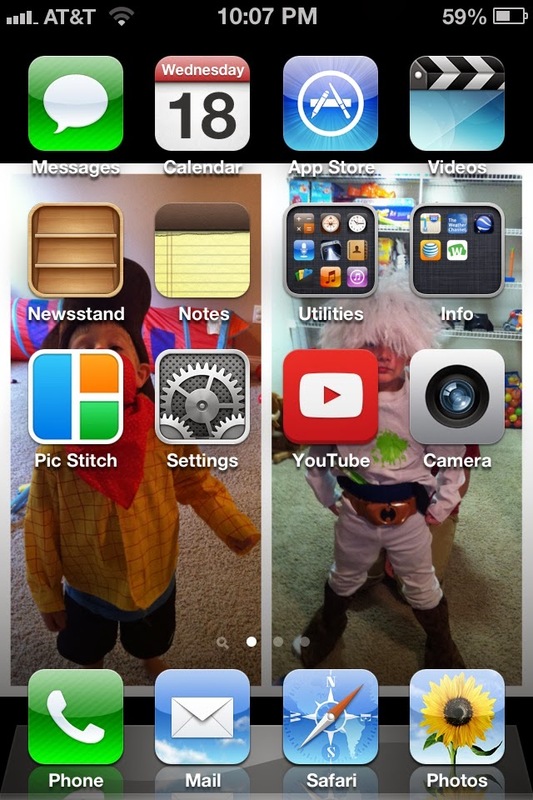 Last week my friend Rachel texted me a picture of her iPhone screen. Little did she know that it was going to make me practically apoplectic. I've told you guys before that when I hold someone else's phone, I hold it like I'm handling TNT. I mean, even if it's an iPhone, another person's phone is so intensely personal that I feel as though it can explode at any second. Her screenshot reminded me that I had an outstanding opportunity to show you all why I feel that way ... if I was willing to put my mental health at risk. I have two screens. One has my Utilities and lesser-used apps on it, but this is my main screen ... and I have several folders for group consolidation. It's still a work in progress. 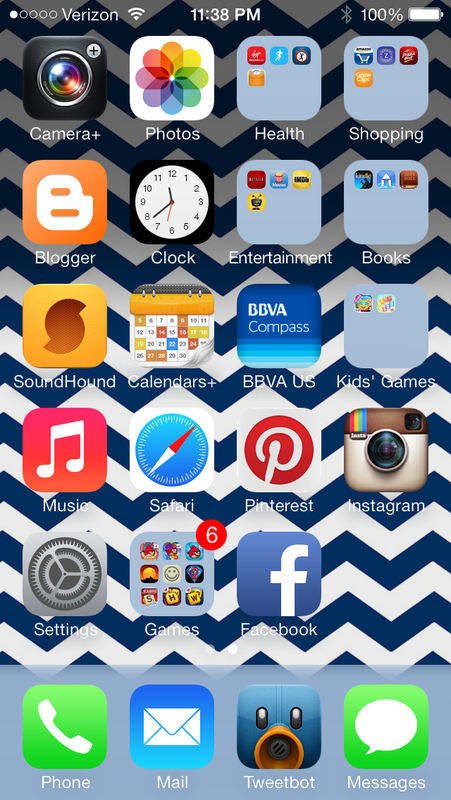 I've customized my background (I love a good chevron), and the bottom four apps in what I think of as the "perma-spots" are the ones I use most often (phone, mail, Tweetbot and text). Full disclosure: I didn't know until about eight months ago that you could move those four around. I thought Safari and Music had to stay down there with Phone and Mail. NOPE! This next person almost caused me to abandon my "project" altogether. She was one of the first to submit her screenshot. 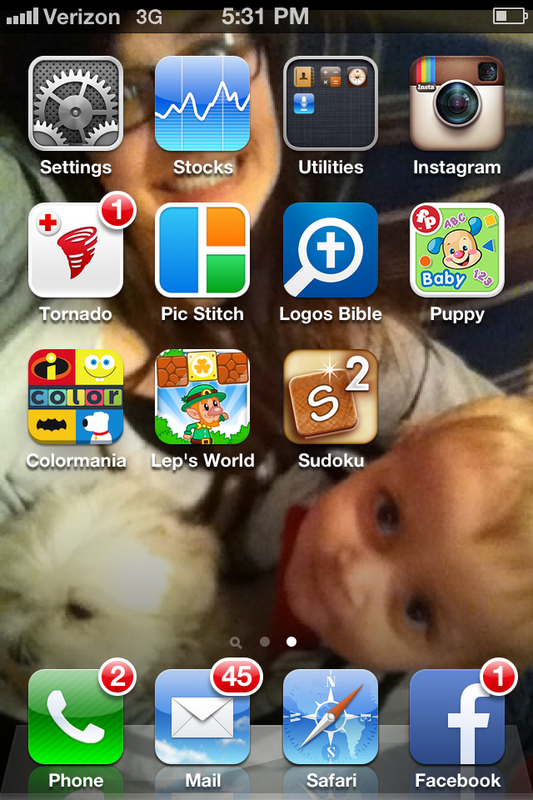 She has six pages of apps, none of which are in folders. She only has three of the four perma-spots filled at the bottom of the screen. 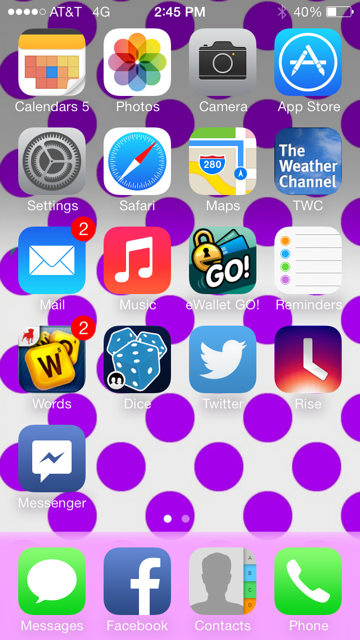 I think she knew -- being a longtime reader -- that I would be having a complete come-apart once I received her screenshot, so she sent me a follow-up email to say, "All my other app pages are in alphabetical order. Does that help calm the stroke?" UMM, NO. 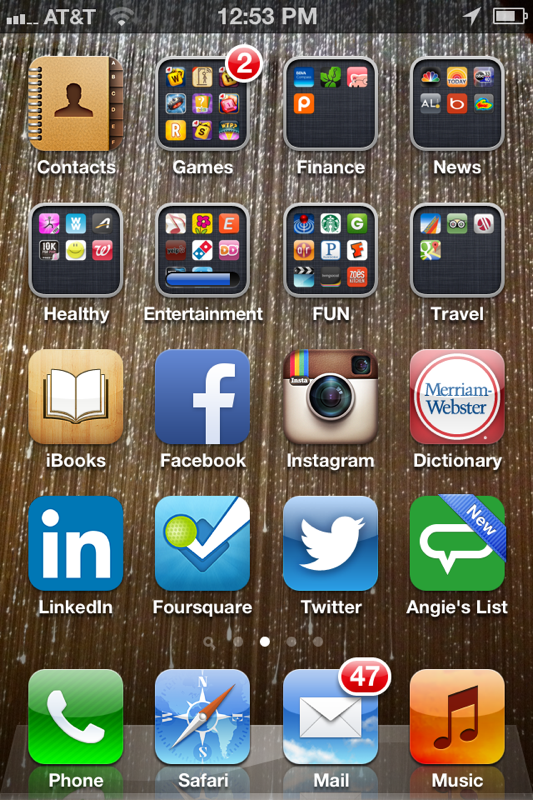 Every time you add a new app and put it in alpha order, it would then shift all your apps over one spot. Then nothing would be where you were used to finding it anymore. GAHHHHHHHHHHH! Question, Internet: What's the word for a person who downloads the Emoji 2 app? I did not know such a thing existed. AND NOW I CAN'T UN-KNOW IT. And here's ANOTHER person who only has three of the four perma-spots on the bottom row filled. There's a special place in Heaven for people who are so creative that they have a folder titled "Misc" and a folder titled "Misc 2" on their phones. 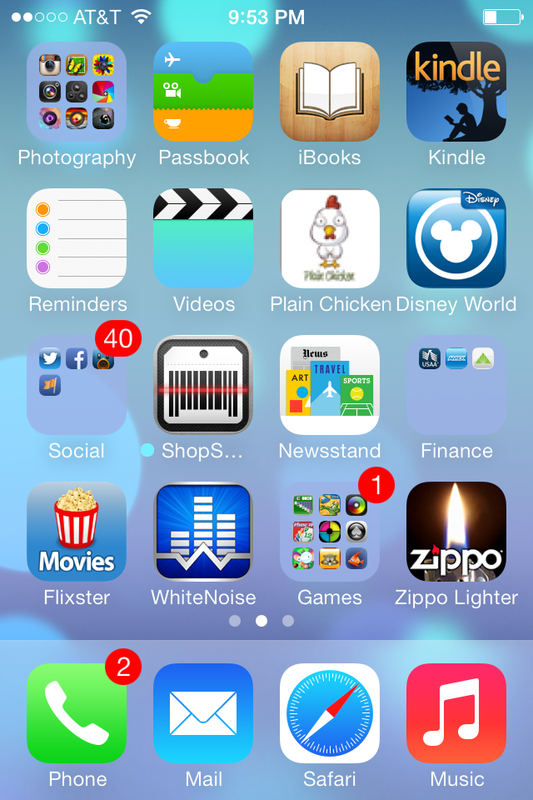 This submitter's phone has the most colorful background AND the most apps I'd never heard of. She also apparently uses Facebook so often that she's one of only two submitters who moved FB to one of the perma-spots at the bottom. NOTED. 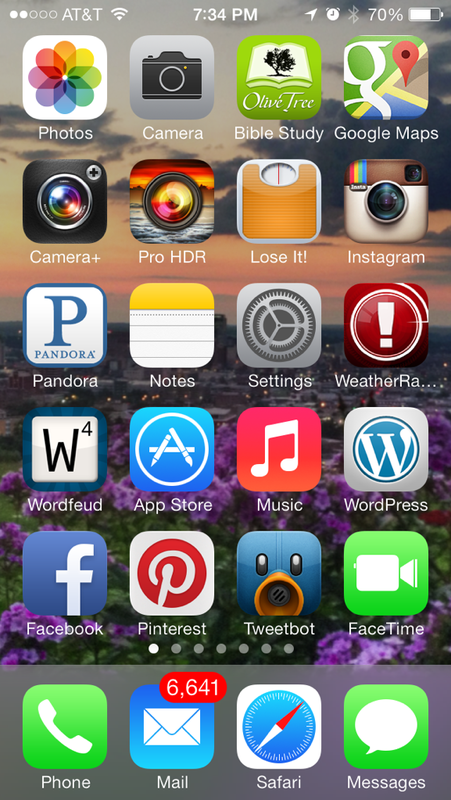 Seeing this submitter's screenshot made me wish there were two rows with perma-spots. I wish I had room for the camera and the photos down there -- but I don't want to give up the other four I have down there. Hmm. When my phone grows up, it wants to look more like this one. Except it won't lie to itself by putting the Blogger app in the "Productivity" folder. Another chevron fan! Holla! 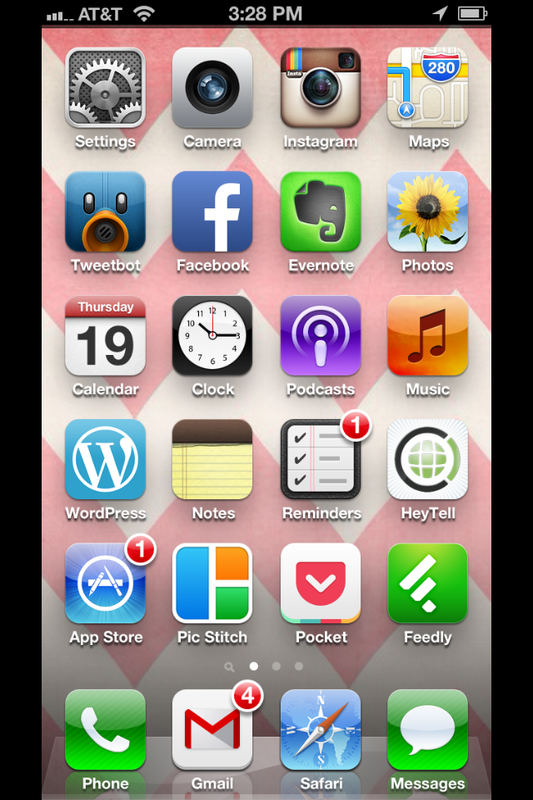 Have immediately decided that I need that Podcast app and whatever Pocket does, based solely on how cute its icon is. HOW CUTE IS THAT POCKET? A Foursquare sighting! I see people check in on Foursquare on Twitter all the time, but I've never known what it was, really. So here's someone who has it on their phone. I feel like I've seen a unicorn. 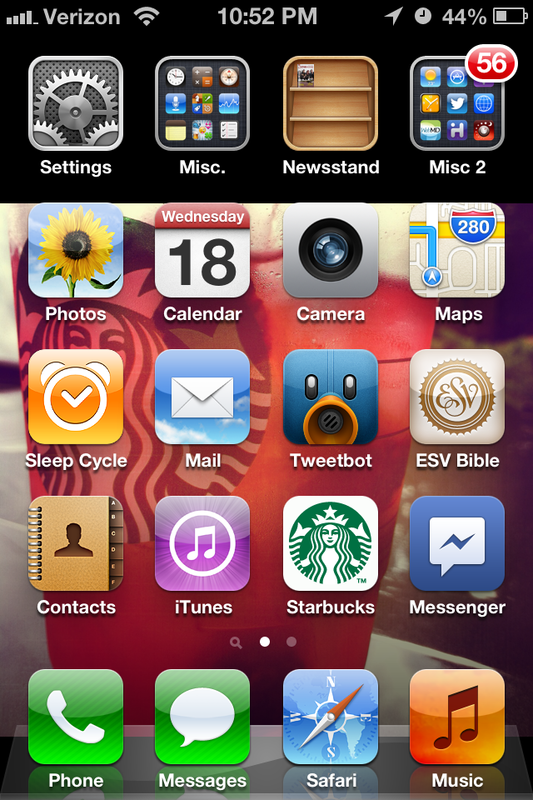 I am fascinated by these phones that are full of apps I've never seen or heard of. Puppy? Logos Bible? Tornado? Colormania? Lep's World? All new to me. 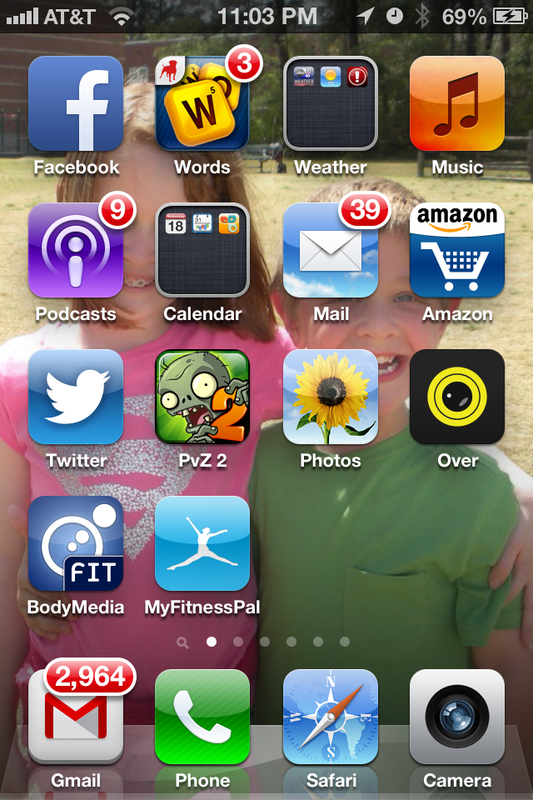 Forty-five unread emails? ALSO NEW TO ME. Cannot even imagine that. ANOTHER FOURSQUARE SIGHTING! So you people really are out there. I knew you had to be; I just didn't know who you were. Also. I just learned from this screenshot that LinkedIn has an app. I repeat, Internet: LINKEDIN HAS AN APP. I'd tell you to download it, but I have a feeling that if you're ON LinkedIn, you're receiving all the news you need from them in your emailbox. If you bother to read your emails, unlike this submitter. I asked this person, "Why don't you have any apps on your phone?" He answered, "I work for a living and have six kids. And it's a work phone. I use it for email, e-reader, and GPS." Those are good reasons. So, Internet, other than the background picture, if you were wondering what an iPhone looks like when you pull it out of the box, it looks a lot like this. I seriously took one look at this submitter's email inbox and I died. I. DIED. 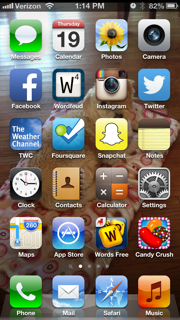 Seven pages of apps and 6,600 unread emails. My stress levels would be off-the-CHARTS. And just when I thought I'd recovered from THAT, I got this one. More unread emails. 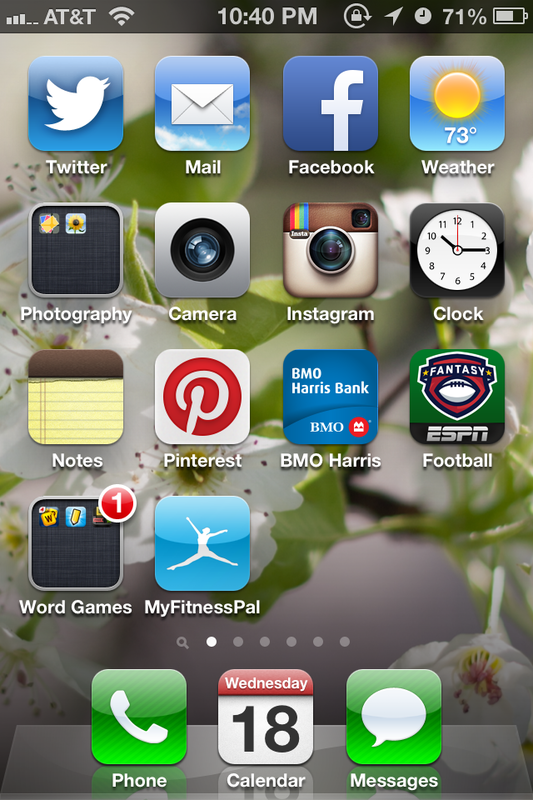 And pages and pages of uncorralled apps. 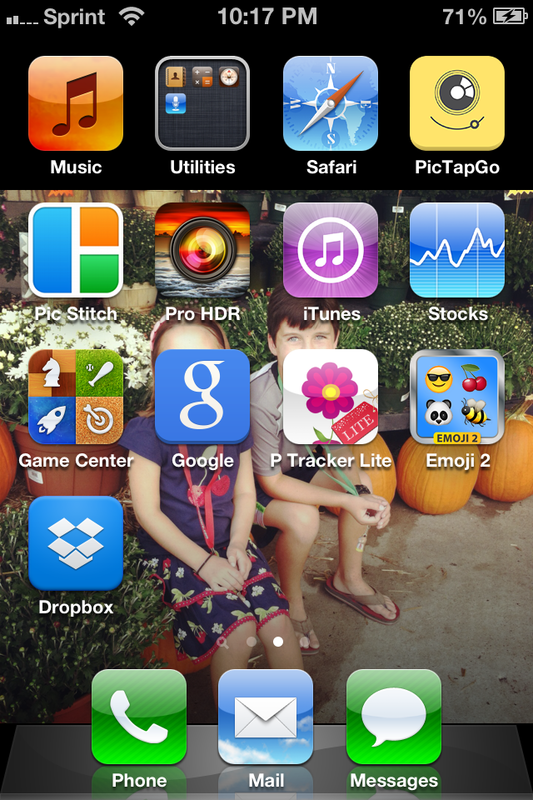 Who knew there were apps you can download that will customize your app icons? NOT I. But now I do. Here's one from a crafty person. Look! 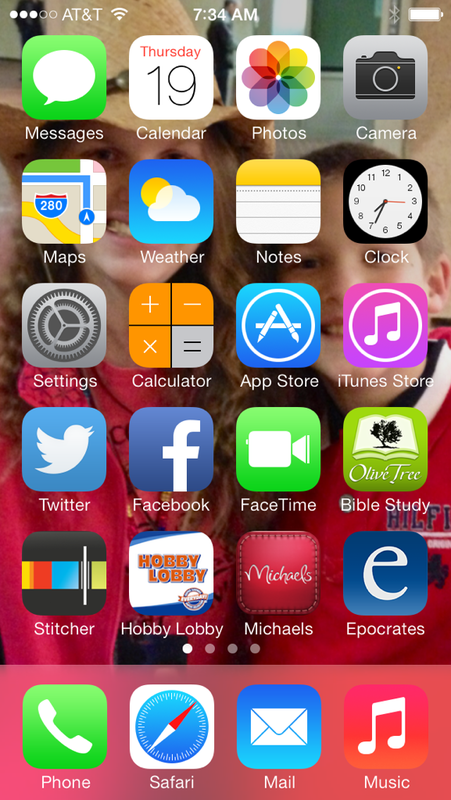 Stitcher, Hobby Lobby and Michael's apps. Looks like EVERYBODY has an app now. Can you light your cigarette from your iPhone now?! This submitter said that she WANTS to move Twitter from page 2 to this page, but she hates visual change, so she can't move it. I know what she means ... I still haven't gotten used to the fact that I moved Tweetbot to one of the perma-spots a month ago, but I stuck with it. Baby steps, T, baby steps. 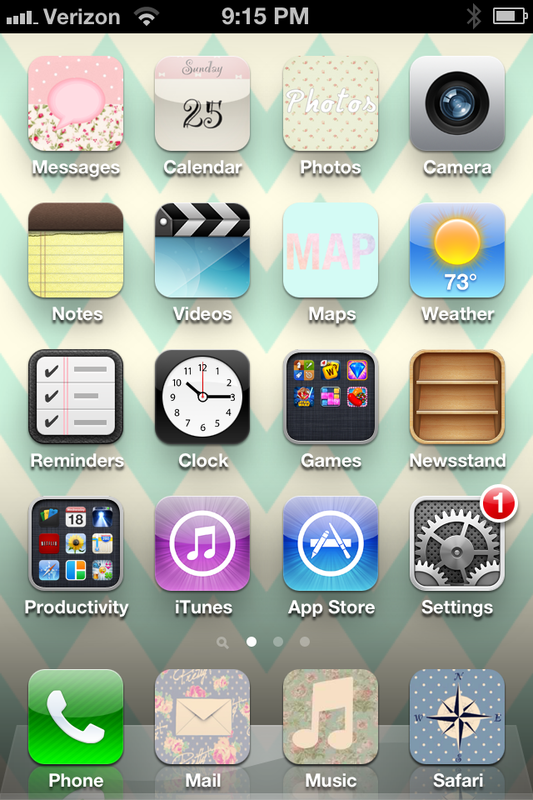 Lastly, this submitter wins the Most OCD Award. 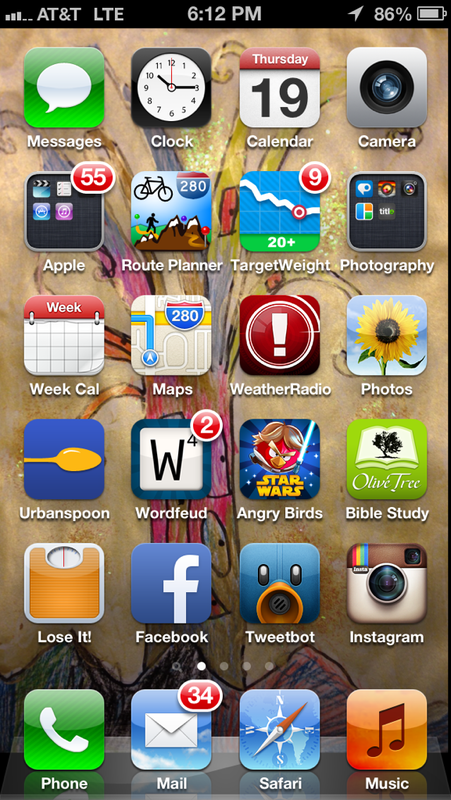 There are no errant apps, no stragglers. A place for everything, and everything in its place. I love it. 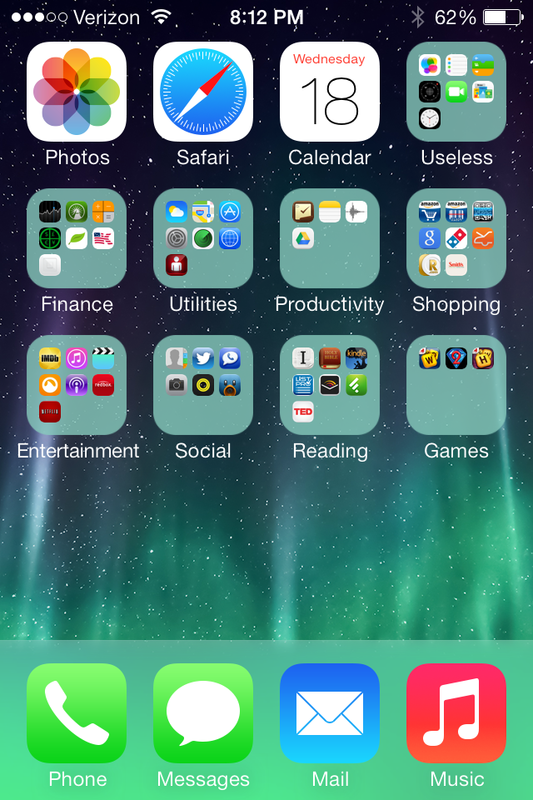 My ONLY issue with it is the phone and text icons being directly adjacent. I briefly had mine like that, and I had to separate them, because the two greens are too similar and my eye kept confusing them. But other than that, good eye, R.
So, Internet. What say you? Did this entire post give you the heebie-jeebies, like it did me to write it? 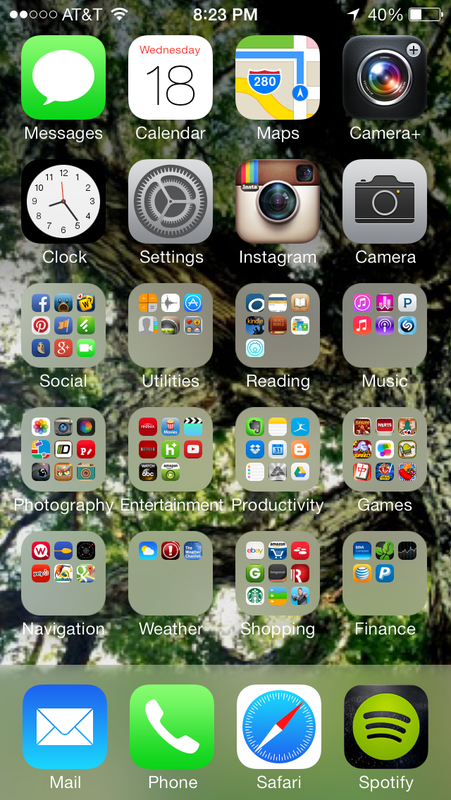 Or does looking at other people's phone screens not turn your brain upside-down? I know one thing ... 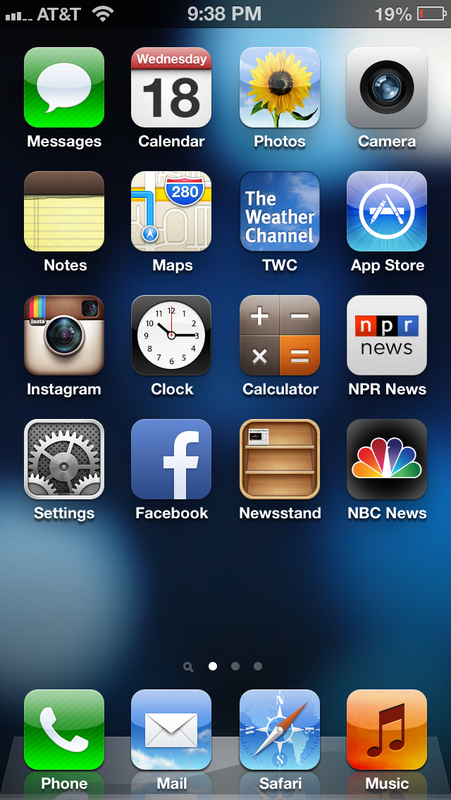 I'm going to have to take a trip to the App Store to check out some apps that look interesting to me today!